Just out of curiosity, do you know if any of the old Boleyn manor still exists at Blickling? No, I don’t think there is any left as the present hall, which dates back to the 17th century, was built on the site of the previous building. There’s a good wikipedia page on it and you can buy a guide from the National Trust site. It’s main claim to fame is its ghosts, both Anne and her father are said to haunt it. Apparently the present hall is built around and on top of the previous manor house. There are still walls from the original manor, but they are enclosed or hidden by the new. I am doing a short internship at Blickling Hall and everyone asks about Anne Boleyn. 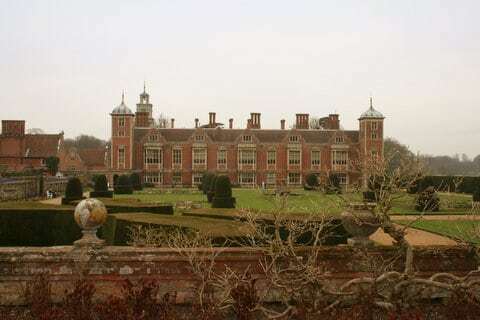 The House Steward (who also lives in the house) says he has never ever had any ghost encounters at Blickling Hall. I was disappointed. This is so very interesting. I have been researching on Ancestry and have found that my 13th great grandmother was Alice Boylen. This means that my 13tg great aunt was Anne Boylen. Wow! I had heard of Anne Boleyn’s ghost before. When I stood at the front of Blickling Hall I felt and saw her presence. She was looking out of a top floor right hand side window. I asked one of the volunteers if anyone was living in the house at this time (31/12/17) as she standing with her hands pressed against the window looking out. I bowed my head in respect. I will be returning on 19 May or sooner. on your date should it not read, January 1, 2018?